When I think of Doerak, I think of Marek's disease. Marek is dreadful for a chicken. 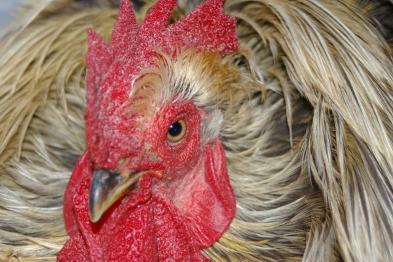 It is the herpes virus for chickens. There are several types of Marek's. We have only experienced the aggressive visceral form. For a long period of time the animals seem perfectly healthy. Then all of a sudden your chicken becomes sick. It manifests itself in different ways so you never know whether you're dealing with Marek's or something more innocent. With Doerak we found a lump beside his crop: a tumour. Because that's what this form of Marek's does: it produces tumours in the vital organs or on the skin. When we discovered the tumour the vet gave Doerak only 3 weeks to live. The tumour was growing fast. Starting beside the crop it carried on growing to a length of 7 cm along the oesophagus. From a natural health practitioner we had heard that the use of sodium bicarbonate could stop the growth of a tumour. It was worth a try. So we started with sodium bicarbonate in his drinking water and complemented his treatment with vitamins, echinacea, garlic and colloidal silver. And to our surprise the tumour stopped growing. It even became smaller. Shrinking from a 7 cm long tube to a ball of 3 cm. But Doerak had weakened a lot. The tumour had slowed down the food flow. He had become very thin. Two and a half months after our first visit to the vet, to be precise on the 12th of July 2008, Doerak left us. Up to the last moment we hoped he would survive this nasty disease. Doerak is a frizzle Cochin bantam. Benjy is the youngest of the whole bunch. He is handsome, funny and very affectionate. He will happily sit on your lap, fall asleep and think: "Phew, finally I can relax for a while, from having to chase after the hens that the other cockerels have lost sight of." 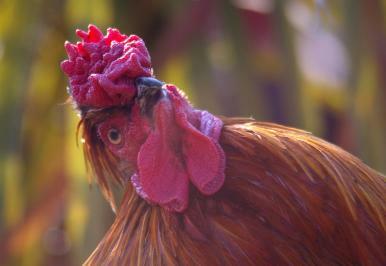 Everything that a cockerel does in his life is focussed on impressing, conquering and protecting the hens. It's a hard job, but someone's got to do it. Benjy in fact was a little mistake. 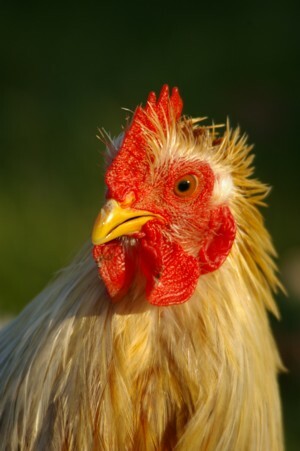 He comes from the egg of a frizzle Cochin hen. We had hoped that the result would be frizzled and a hen. Unfortunately he is neither, but he is still valued as much as the others. Benjy is a Cochin bantam. Kelly's appearence was a big surprise to us when he grew up. As we put two Cochin eggs under the broody hen Rusty, we expected to get 2 Cochin chicks. But Kelly didn't grow a comb for a long time and after a while he got some little fluffy feathers on his head just like Silkies do. Kelly is a Cochin/Silky cross. As we only have one Silky cockerel Silverback must be his father.